We made it! We made it through the 59-day winter gauntlet that makes up January and February and then the long six-week-or-so grind that is spring training. We are in the week with actual baseball and just three days away from first pitch. This week’s questions are Yankees heavy with the hype and anticipation of the second straight season with championship expectations. 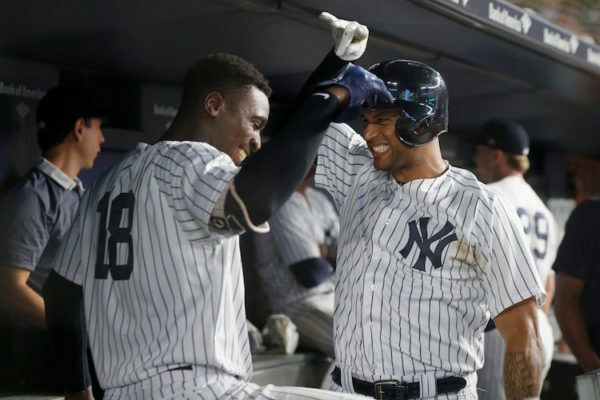 The 2019 Yankees are set up to be the best Yankees team since their last World Series title and appearance 10 years ago, and we are very close to them finally playing. Email your questions to KeefeToTheCity@gmail.com or engage on the Keefe To The City Facebook page or on Twitter to be included in the next Monday Mail. 1. Manny Machado is 26 years old (younger than Aaron Judge), and historically speaking, he most likely hasn’t even entered his prime yet. 2. He plays BOTH shortstop and third base and is a two-time Gold Glove winner at third. 3. He’s a career .282/.335/.487 hitter, who has averaged 31 home runs and 90 RBIs per season. 4. He’s coming off career highs in games played (162), home runs (37), RBIs (107), batting average (.297), on-base percentage (.367), slugging percentage (.538) and OPS (.905). 5. Outside of a knee injury in 2014, he has played in 156, 162, 157, 156 and 162 games in his full Major League seasons. 6. All he would have cost is money. MONEY. The thing the Yankees used to use to their advantage to create the best team possible. No prospects, no young, cheap players. Just MONEY. 7. On top of all this, he has played 860 of his 926 career regular-season games in the AL East, knows the pitchers and has made it clear he absolutely hates the Red Sox. I’m not sure how anyone could look at those facts and not want Manny Machado on the Yankees. Because he made the comment about not running hard on every routine ground ball last season? I’m OK with someone not sprinting it down the line on a guaranteed out when they are playing Gold Glove defense and hitting 37 home runs with a .905 OPS. Right now, the Yankees think Troy Tulowitzki is going to be their shortstop until Didi Gregorius returns. The same Tulowitzki who didn’t play a game in 2018, wasn’t good in 2017 and hasn’t been good for some time now. And if Tulowitzki isn’t up to it, then the middle infield will be Gleyber Torres and DJ LeMahieu and then Tyler Wade at some point. What happens if Miguel Andujar never improves defensively at third base or doesn’t progress the way everyone just expects him to? What happens if Didi Gregorius isn’t the same player when he returns from Tommy John surgery, or what if Gregorius leaves via free agency after this season? Then what is the Yankees’ middle infield of the future? Still thanking God the Yankees didn’t sign Machado? I have written, tweeted and said a lot of negative things about Aaron Hicks since he first became a Yankee. Was I wrong? Not completely. Hicks became a very good Major League player in 2017 and continued to be one in 2018. Prior to that though, he was the same-old first-round bust who couldn’t put it all together. The biggest problem with Hicks is that he can’t stay healthy, which he is showing once again as he won’t be ready for Opening Day and probably not for more than a week into the regular season. If Hicks can give the Yankees what he did when he was actually on the field in 2017 and in 2018 then this deal will be an all-time bargain. If he can’t, well, at that number, it will still be a bargain. The Yankees finally stopped their idiotic “no extension” policy and gave both Luis Severino (four years, $40 million) and Aaron Hicks (seven years, $70 million) extensions. Next up: Dellin Betances. There were already reports the Yankees were discussing an extension with Betances and then his shoulder issue happened, and you can’t help but feel bad for the guy. He will be a free agent at the end of the season and he has been the best reliever in all of baseball over the last five years, which includes his disastrous end to the 2017 season. Over the last five seasons, Betances has appeared in 349 games, pitching 373 1/3 innings with 607 strikeouts, a 2.22 ERA and 1.108 WHIP, allowing just 5.3 hits-per-nine innings with an astounding 14.6 strikeouts-per-nine. Absolutely ridiculous numbers. Unfortunately, the shoulder problem came up at the worst possible time, both for the 2019 Yankees bullpen and for Betances’ future earnings. Betances has been one of, if not my favorite Yankee since Number 2 retired and as a native New Yorker and homegrown prospect who has always said and done the right things, it’s hard not to like him (unless you’re Randy Levine). As long as this shoulder problem does turn out to be a minor thing and he returns to pitch like he always has (minus the end of the 2017 season), extend him! Didi Gregorius is a little trickier. He’ll most likely return sometime this summer and be the productive offensive and defensive player he’s always been (outside of 2015) for the Yankees. But it’s not certain. There’s a chance Gregorius isn’t the same player he was prior to Tommy John surgery and I would think the Yankees will wait to see how he performs before extending him. It’s also not a necessity to extend Gregorius. Yes, he’s a fan favorite, outstanding defender and one of two reliable left-handed bats in the lineup. But the Yankees have Gleyber Torres for at least six more seasons and have DJ LeMahieu for this season and next. It’s not impossible to see the Yankees let Gregorius leave as a free agent if they aren’t able to extend him to a team-friendly deal and if he wants and thinks he can get more on the open market. Gregorius will be 30 for the 2020 season and if he’s looking for a five- or six-year deal, I don’t know that the Yankees will be interested in that. While Bryce Harper isn’t “only good for home runs”, if he were, that’s not exactly a knock. That’s the best thing to be good for. Home runs equal runs. Runs equal wins. Wins equal playoffs. Playoffs equal chance to win championships. Last season, Harper batted .249/.393/.496 with 34 home runs and 100 RBIs, while scoring 103 runs and walking a Major League-leading 130 times. He’s a six-time All-Star in seven seasons with an NL MVP to his name and a career .900 OPS. If there is one thing Harper is “only good for”, it’s getting on base, and that’s the most important thing a hitter can do. The question becomes, is Harper worth a 13-year, $330 million contract? If a 25-year-old Giancarlo Stanton was worth 13 years and $325 million then you could say a 26-year-old Harper is a bargain at a $330 million. Prior to to the offseason, I thought Harper would get at least $400 million, so for him to get only $330 million is a bit shocking. It’s concerning the Yankees have a young core of players making relatively no money between Aaron Judge, Gary Sanchez, Gleyber Torres and Miguel Andujar, and you can even throw in Aaron Hicks, and yet, they didn’t sign either 26-year-old generational star this offseason. Back in 2016, it seemed inevitable the Yankees would sign one if not two of Harper and Machado, and yet they signed neither, and that was before they hit on every top prospect of theirs. The Yankees couldn’t have asked for a better situation going into this offseason with a cheap, young core and having reset their luxury tax, and they failed to sign either of the best two position players (Harper and Machado) and the best (Patrick Corbin). This question came in before Mike Trout signed his $430 million extension with the Angels, but if he hadn’t, if you think the Hal Steinbrenner Yankees were going to suddenly change course two years from now and sign a 29-year-old Trout when they wouldn’t sign a 26-year-old Harper or a 26-year-old Machado, well, you’re sadly mistaken. As for the possibility of the Red Sox winning back-to-back World Series titles mattering, the Yankees failed to sign any of the Top 3 free agents after the Red Sox won 108 games, beat the Yankees for the division and then flat-out embarrassed them in the ALDS on their way to a championship. Want to be included in the next Monday Mail? Email your questions to KeefeToTheCity@gmail.com or engage on the Keefe To The City Facebook page or on Twitter. My book The Next Yankees Era: My Transition from the Core Four to the Baby Bombers is now available as an ebook!